Northants rockers The Big Dirty are headlining The Lab this Friday. The band recently released the new track Paradise On Fire which is available now via their Bandcamp page. The track follows 2017’s single Rhythm Of My Drum. The Big Dirty comprise singer Jonny Rocket, guitarist Chris Datson, bassist JC and drummer Quigley. 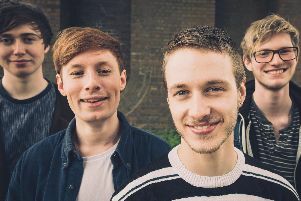 They formed in 2013 following the “sunken wrecks of various alternative bands”. The band fuse '70s and '80s rock influences and in recent years have headlined gigs across the region as well as playing at The Scala and The Amersham Arms in London. Support at The Lab is by fellow Northampton rockers Over The Influence and Milton Keynes trio The Dead Melody. Doors at the Charles Street venue open at 8pm, music is from 9pm. Tickets cost £3.50 in advance or £4 on the door. Advance tickets are available online via SeeTickets.